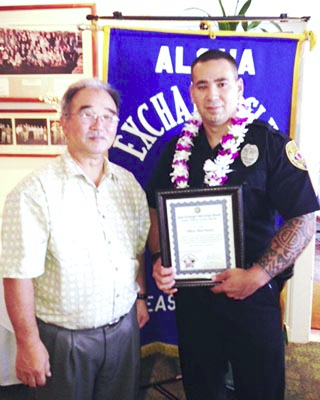 Aloha Exchange Club President Jay Kimura, presents an "Officer of the Month" plaque to Officer Shea Nactor. The Aloha Exchange Club of East Hawaiʻi recognized Officer Shea Nactor on Thursday (July 25) as “Officer of the Month” for July. Nactor was honored for tracking down a murder suspect within three hours of the crime. 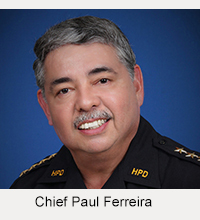 On May 20, Nactor was among the officers who responded to a report of a shooting in Nānāwale Estates. The victim had been killed with a shotgun and the suspect had fled the area armed with a firearm. The suspect was apparently on the road during rush hour and was reportedly agitated, posing a possible threat to other citizens. Nactor and other officers began to search for him. In an attempt to gain information about the suspect’s whereabouts, Officer Nactor began contacting persons in the community. 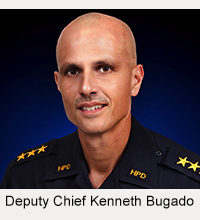 As a result, he developed a lead that the suspect had traveled to a home in the Hawaiian Paradise Park subdivision. He led the search team to that house, where officers were able to arrest the suspect without further incident. Sergeant Jurgen Canda, who nominated Nactor for the award, said the officer fulfilled the Police Department’s commitment to working cooperatively with the community to provide a safe environment. “The resourcefulness and initiative taken by Officer Nactor led to the swift arrest of a murder suspect and prevented any further potential deadly encounters with the public and law enforcement officials,” Canda said.